Every Thursday, we have a group 6-10 friends over to eat dinner, shoot with nerf guns and watch TV. Thursday night is quickly becoming my favorite night, mostly because we’re building relationships and friendships that I’m pretty sure will last a lifetime. We’re creating traditions and memories that are priceless and dang…the food is good! 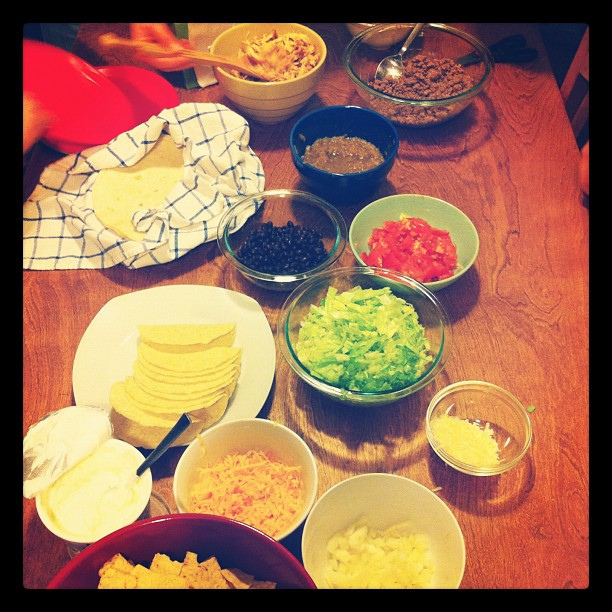 This past week we had a build-your-own taco bar. Each person brought a different ingredient (or 2), and we were in charge of tortillas, chicken, chips and salsa. I considered cracking open a bottle of Pace Picante, but remembered that my Mother in-law gave me a recipe for a family famous salsa. Please give it a try, it’s easy and so delicious! 5. Pour into a bowl, cover and let sit overnight (or as long as you can). **Have a couple cans of stewed or diced tomatoes on hand. If the salsa is too hot, put a can of tomatoes in the blender for a few seconds, then add to salsa.